Hey everyone! It's being a great year start and our team is doing its best to provide constant improvements to our online product design tool. Let us have a look at what LiveArt will be in the coming versions. Support of social networks. Adding own images from Instagram or Facebook has already become a must for most personalized products: phone wraps, custom canvases, cases, pillows and apparel as well. Allowing people access their Instagram feed with a click is another priority we are going to hit. Responsive online designer. Yes, after a number of UX research tasks, our team is about to release a responsive version of LiveArt HTML5, allowing users design their beloved customized products on smartphones including Android, iOS, or Windows-based devices. More specifically, this would be also another step towards a complete design revamp of the tool scheduled to take place later this year. Designer = Configurator. In addition to being an online product designer, LiveArt HTML5 became widely used as universal product configurator, where users can create their own product with parts or by modifying the existing options. More integrations coming. For hosted platform of Shopify and another integration for well-known .NET platform - nopCommerce. As we have launched a Vote For Feature portal at http://liveart.uservoice.com/ you are more than welcome to check in regularly as well as subscribe to our Facebook and Twitter for updates. Have a Happy Coming Christmas! 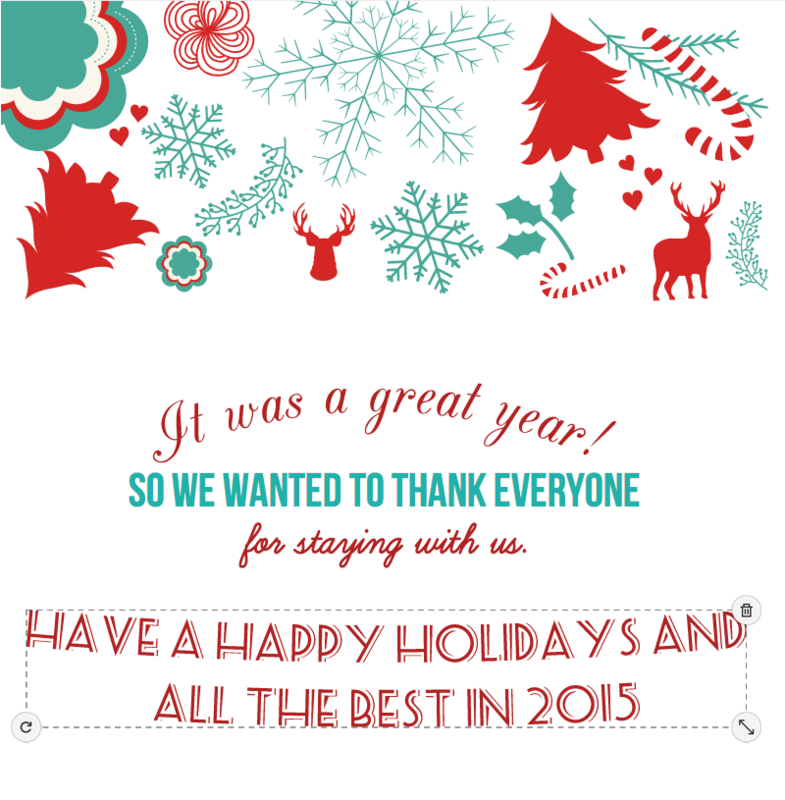 It was a great year for our customers! Many enjoyed having LiveArt for their websites and we enjoyed working with a new market challenges. Our product designer has been used in many industries, surviving numerous customizations and integrations and improved with a lot of the feedback. We look forward to YEAR 2015 in building even more sophisticated product designers and configurators! Take a moment to relax and design own Christmas card :) Yes, using LiveArt Designer! So it's time to prepare Christmas presents! Mention us the "Rudy the Reindeer" keyword and get an unprecedented 25% discount on any LiveArt license (including source and OEM ones) or any custom work. Hurry up! The special will be available till Jan 10, 2015 purchase requests only. In LiveArt HTML5 Product Designer, we heavily rely on the SVG format that becomes an industry standard for web applications including responsive applications for tablets and smartphones. SVG represents clean vector format, which means it always looks crisp and nice regardless of your resolution, monitor or device. Whether it’s Retina-based or plain old LCD, vector would render without any artifacts. However, on the back office of the decoration industry, there is always state-of-the-art software that requires specific format the output should be. In some cases this is 300 dpi PNG or TIFF, in other - EPS or PDF vector formats. Since these may not relate to web, one need to be able to produce proper production output out of the LiveArt HTML5 one. If you are using LiveArt Shop solution like Magento, Shopify or WooCommerce, the proper output technology could be already built-in. If you are integrating LiveArt yourself, there are multiple tools you can use to convert the output LiveArt Design SVG into appropriate format for your production purposes. Inkscape is a tool that was developed originally for authoring and editing SVG files. Due to it’s open source nature, it’s freely distributed and also included as port for major server platforms including Ubuntu. By using Inkscape from command-line, you can convert the vector into EPS or rasterize with given DPI setting into hires PNG. PhantomJS is an extension to NodeJS and can be used to accomplish PNG previews of the web pages. By utilizing this feature, one can also prepare screenshots out of the designs, produced by users. PhantomJS might be a good choice if you are NodeJS fan or need simple and quick conversion of SVG into PNG formats of various dimensions. This is a new hosted service that also features API to upload and convert images in numerous formats. Among others, it can export SVG into a number of formats like EPS, PNG, TIFF and so on. Last but not least, is the choice of millions developers around the world, the magnificent ImageMagick image library and command-line tool. This is an extremely powerful tool that can identify, convert and edit images using vast options and opportunities. While it focuses on bitmap processing as its main purpose, ImageMagick’s convert command-line tool can be used to produce large bitmap images from SVG. Best results achievable with rsvg delegate, which is installed as separate application. Regardless of the solution you would choose, LiveArt team would always be glad to assist and consult on obtaining a production-ready output for your particular integration or project. This post briefly describes the new attributes that became available with 0.9.5 version of LiveArt. New attributes can be used as optional unless they start to throw exceptions in console. defaultProductSize attribute can be set for arbitrary size products (e.g. signs) and is non-mandatory. include* attributes allow including/excluding certain working elements from the designer SVG output. These will be hidden, if false. Additional definitions for products allow for more flexible product setup, including newly introduced signs. With colorizableElements you can now use single multicolor SVG with multiple colorizable areas. "multicolor": true, should be strictly used with colorizableElements to ensure colorizing. "resizable": true, indicates that the product can be resized. Should be used with sign type of products. "showRuler": true, shows ruler for resizable products. 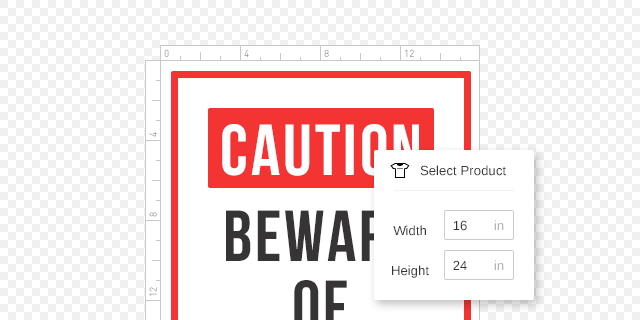 You can indicate validation range for the sign dimensions using the above attribute inside locations block. Used with sign-based products only. Use the above construction if you need to define set of strict sizes, which can be selected. "hideEditableAreaBorder": true, can be used to hide the printable area frame for specific product. Use mask reference in location to specify a mask that should be an overlay per certain product location. 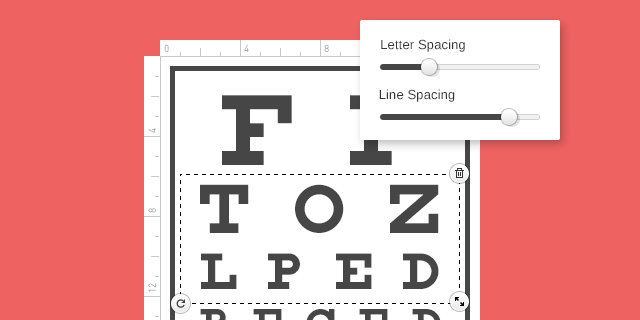 boldAllowed, italicAllowed allows disabling the bold, italic for certain fonts if they are not available. ascent quite specific attribute that is required to calculate real height of letters for sign products. It's representation should indicate font height in pixels for 32pt font size. vector this reference is required if you plan to use the vector effects. All in all, we highly recommend looking into the sample config files you receive with upgraded package to learn the practical usage of new attributes. Our team proudly presents next version of its product designer component, written in pure HTML. We have gathered up tons of feedbacks, wishes and requests to make LiveArt HTML5 even more sophisticated yet simple for technical implementation. For more technical insights, developers are more than welcome to review our updated documentation. Clippable printable area. 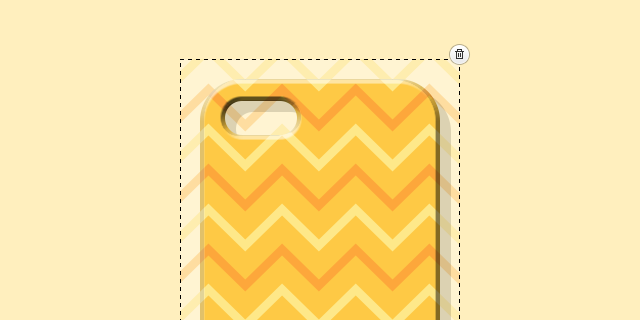 Each product may now have a rectangle clippable area, which will clip anything you drag beyond it. The area is defined using the coordinates, no extra product artwork would be required. The clipped design area is a basic function for apparel decoration and design software for common promotional products like mugs and pens. This would also enable nice design opportunities such as overprinting patterns and combining design elements. Resizable products with ruler. Producers of signs, stickers, banners, wall decals, paper stationery, custom stamps and other similar products can now easily configure resizable products instead of populating catalog with common sizes or using alternative software for these types of products. Custom masked products. Specifically crafted and printed products that have irregular shapes can now be easily prepared and published into LiveArt using masks. New version contains samples of phone covers and decals that allow users to preview the designed product exactly as it would look, having design cropped or faded exactly as it should. A multiple new features appeared for text decoration. 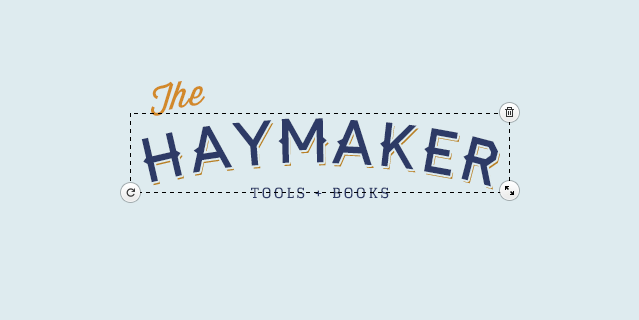 Let your customers be more creative with text effects and more precise adjustments for them. Multiline Advanced. 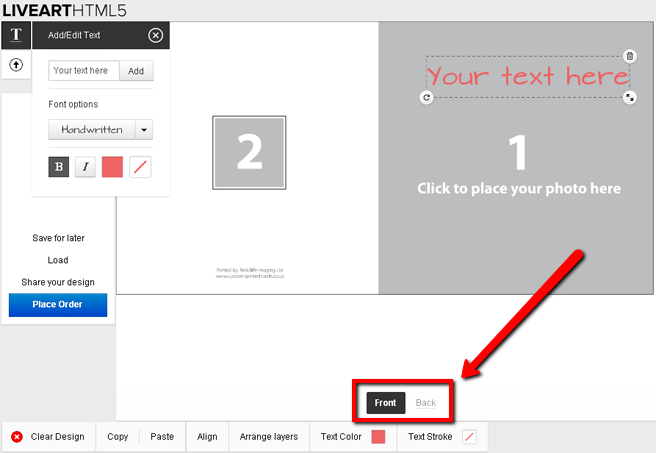 LiveArt HTML5 has been powered up with native support of multiple lines of text with a number of common adjustment. Professional controls include letter spacing, line spacing and precision adjustment (using the size fields). Still all UI/UX parts are open, so you can always disable the controls you desire to be hidden for the user. Text Effects. LiveArt HTML5 is finally powering itself with a gateway to powerful effect engine producing text effects for the chosen fonts including: arc, arch, inflate, perspective and lots more. Allow your customers build truly unique designs and yourself to please them with bespoke templates for products. 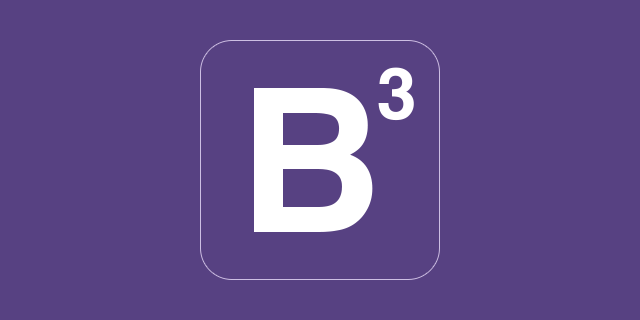 Bootstrap 3 Styles. The whole UI now uses base bootstrap css of version 3. Despite we would encourage using iframe during the integration, one can embed the LiveArt into bootstrap 3 website without having to request LiveArt CSS upgrades. Canvas API Calls. Developers can use single API call (userInteract) for accomplishing a number of automated actions throughout the LiveArt, without requesting modifications of the LiveArt core. These include selecting a product, adjusting the product size, selecting printable location, selecting product layer color, control quantities as well as names and numbers, add graphics or text and much more! Of course, the new build also includes lots of minor updates, bugfixes and overal improvements. We would love to hear the feedback and enjoy the new build. Mention us the keyword CRABWISE to get a straight 10% discount on the license until Nov 30, 2014. In a 2012 study, Google found that 90% of today's media consumption is screen-based, and noted that consumers regularly bounce from PCs, tablets, and smartphones. With multi-screen behavior becoming the new normal, it’s critical for businesses to adapt and focus on cross-platform development to better meet consumer needs. Additionally, a 2013 report from Statista found that in today’s BYOD (Bring Your Own Device) world, 49% of respondents said they used their personal devices for work as well as play. With so many different devices in the workplace, it’s essential for apps to perform seamlessly across multiple platforms. Businesses may worry about the challenges associated with cross-platform development, like available resources, time, and cost. Luckily there are tools and resources available to help companies better manage the process. These tools can help developers more quickly create apps at a lower cost, with the added bonus that many of these tools are simple to use. For example, LiveArt's HTML5 Mobile Ready Online Product Designer and it's plugins for platforms like Magento, WooCommerce or Shopify are available for phones, tablets, desktops, and other devices that don't support Flash. They also work with multiple browsers and the Online Product Designer can be added to any existing website or e-commerce platform as a simple web component. The days of an app that only performs on a single platform or browser are gone. 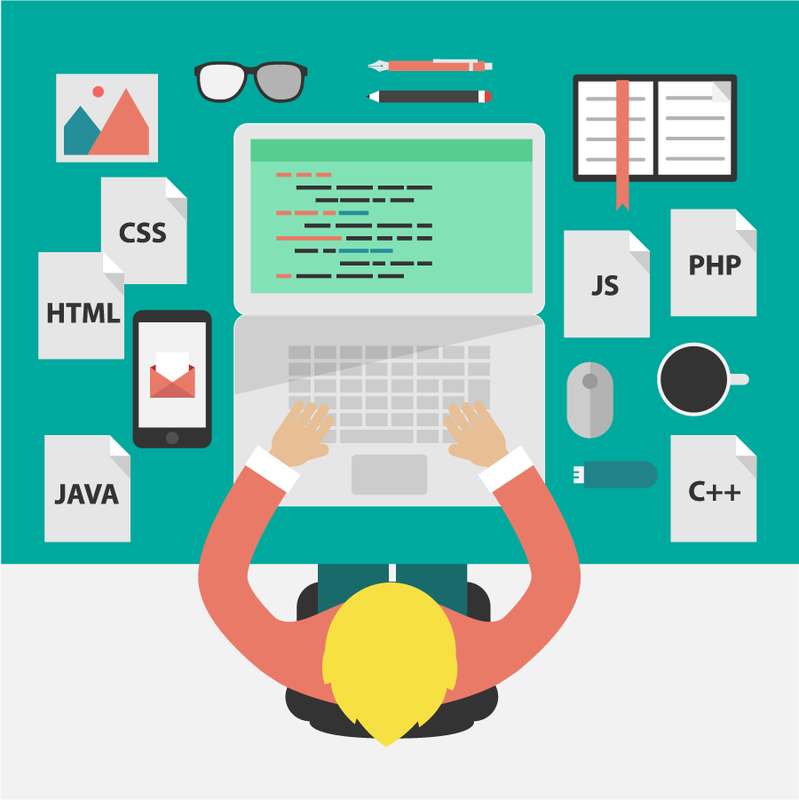 Cross-platform development not only allows developers to maintain just a single code base, it gives them the capability to fix bugs or other issues immediately on any platform. Having one code base will also reduce cost because it involves less testing. Users on cross-platform apps also benefit because even those with limited experience can be taught to maintain platforms with a custom content management system. This further reduces businesses cost because it allows an in-house team member to maintain the content and make changes when necessary. Instead of hiring separate developers to create apps specifically for a single platform, businesses can leverage in-house teams and individual employees to maintain operations through the content management system. Changes made by that employee will be reflected across all platforms, rather than having to engage multiple developers to make changes on one single platform. A developer can use code multiple times rather than rewriting sequences. Once something is coded it can be re-used in other platforms. Many cross-platform development tools and frameworks are designed to easily integrate with cloud services, allowing businesses to take advantages of their current enterprise solutions, such as Salesforce. Plugins and other modules can quickly and simply be plugged in to available frameworks, tools, and services. These components make it easy to add specific new features to the app. Cross-platform development makes it easier and faster to deploy changes and updates across multiple platforms. Developers can focus on one app and one code base rather than dealing with various programs, which saves the developer time and the company money. 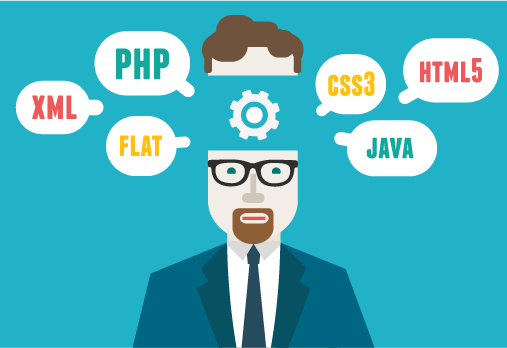 Cross-platform development is the smart decision in today's world of ever-evolving technology. Businesses should take advantage of the tools and resources available to them, as it will save both time and money in the long run, which will allow companies to generate higher profitability overall. Nick Rojas is a journalist based in Chicago, IL. His work often covers content creation and technology. You can follow him on Twitter @NickARojas. This post was inspired by a business meeting I have conducted recently. Among the obvious common talks on business objectives to be met and requirements for a personalization tool, a number of concepts was talked. Most of these will sound familiar or even trivial, yet they clearly show how the design tool may bring your business in the world of tomorrow, where having a product customization would become a must. Today it’s not just about personalization. It’s about someone expressing their own identity by means of having their own unique product, whether it’s a t-shirt, mug, wristband or a postcard sent to a friend. Respectively, they do it from your website with an online design tool. 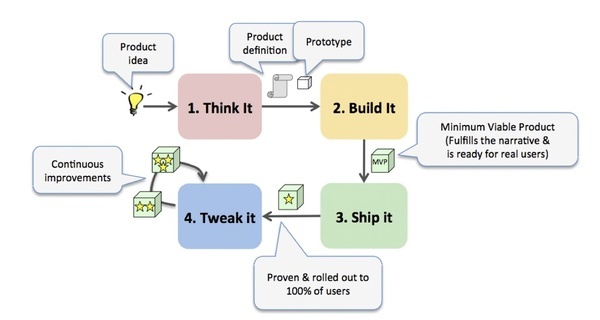 Your product designer is not just a designing tool, but a whole identity builder. As a marketing tool it can be central for many activities across your ecommerce site that will constantly drive your business forward. First off, you can enable customization for a pre-made products. Normally, customers would ask you to amend a label or replace an image with own logo. Making such products “designable” will ease you up on accepting and streamlining the orders. A whole new automated sales channel will be open to scale up your overall sales. By having more and more of designed products, you will be knowing what your audience is up to and, thus, knowing the communities you are catering. Is it a stag/hen party guys, students, brotherhoods, universities, family reunions, politics or such? Those kind of ideas would allow you building up a gallery of pre-made designs people can look over, engage, open up in designer and make an order of the amended or same design. Finally, what may hold users from sharing their ideas across social networks and their friends? Incentivise your customers to share their orders. With the modern social rebate systems they can win discounts or free products once they gathered up lots of likes for something you have printed for them. 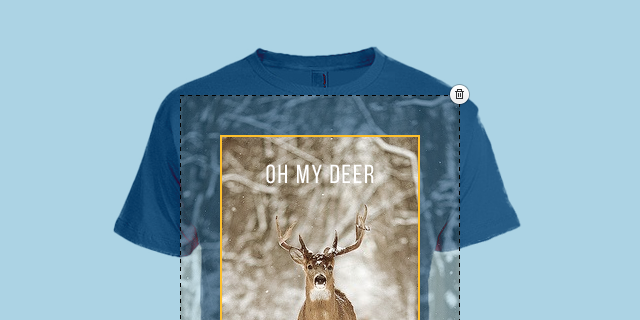 Not to mention that such social users would bring you more customers to have a personalized apparel of their own. When catering communities or organizations you can always put design tool as central point of sale. Projects like Teespring allow for launching campaigns where one’s idea may bring individual profit and bonuses. Why not promoting your own business and product in a same way. Building a fundraising micro-sites around your customizable product would open a whole new scaled channel of sales! All of the above is not a limited list, you are always limited by just your imagination. 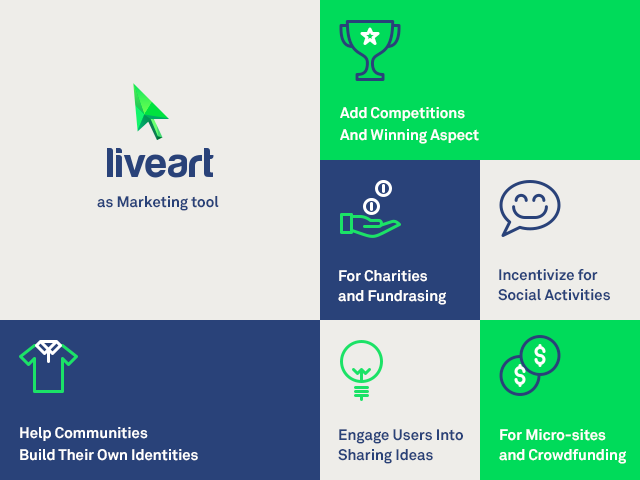 Social projects, fundraising, charities, crowdfunding all of that is just one LiveArt away to let it happen to your business. For decoration industries that cover large markets and require complex web to print solutions, our development team offers an open and collaboration-rich process to achieve specific business goals of your market. Our team is capable of handling complex projects that may involve online product design tools and complex processes - from initial inception to final deployment. Respectively, we don’t end it up on final sign off and provide continuous support and updates. Oh, and did we mention that we always embrace the challenge and push the limits of mobile web? Yes, we always look for something new and never stop. Planning to go big? Share your plans to us! If you own product personalization business you can get benefit from online designer. To begin with, you should look for a solution based on the type of the product. Designer with one-side support works good for decals, signs or banners. What if you want to offer to personalize 4 sides of a uniform (i.e. front, back, left, right)? Or what if you offer to customize all 6 sides of a gift box? With one-side designer you would have to show different sides of your product as separate items. That would be confusing and frustrating for user to work with the designer. In such a case support of multi-sided products becomes one of the key criteria of your choice. Simple switching between sides and instant preview of any changes will help customers not losing their design of front while working on back design of some product. 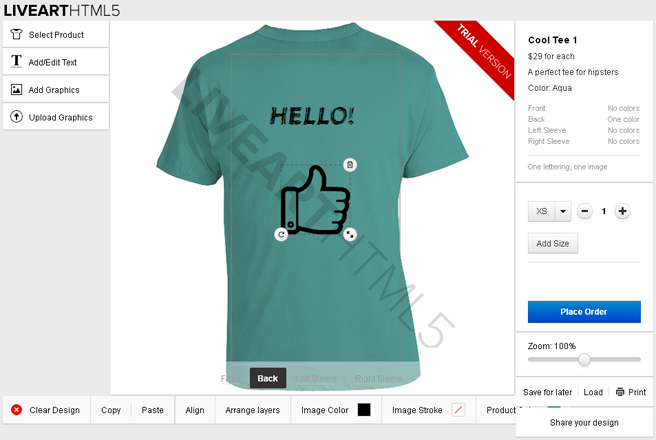 LiveArt HTML5 Product Designer allows user to personalize multi-sided products. The number of sides is optimized for up to 6, but more are available with slight customization. You can use it for custom printed gift cards, uniform, business cards and wide variety of products that needs multi-sides support. 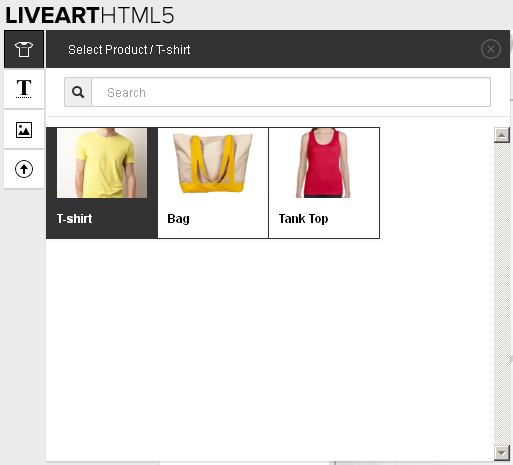 With LiveArt HTML5 Product Designer you can make set of different products with different number of sides each. You can have in your designer t-shirt with 4 parts for user customization (front, back, left sleeve, right sleeve), bag with 1 side to customize and tank top with 2 sides at the same time. If you want to offer to your customers customization of more than one side of the product you face the problem of multi-sided support of your online designer tool. LiveArt HTML5 Product Designer easy solves this problem allowing multiple sides for various products. Clear and intuitive interface helps your potential customers proceed with online designing up to final order making the creation process of unique item clear, simple and pleasant. For small shop owners introducing the online product design feature is a simple step by choosing among the applicable tools on the market. You just walk into sites, talk with people, try the software and agree on signing up if it matches your expectations and the printing technology. For large companies, it does not work like that. Large portals implement various types of non-standard user stories like choosing between various decoration types, having a preliminary registration, offer large number of products and their variations and lots more. Implementing an online design solution for such companies requires a tailored approach and a proper guidance process. Having over 10 years of experience in working with decoration industry companies, we have adopted an easy process, coined by Spotify once - Think It, Build It, Ship It, Tweak It. The four phases of the project allow us to align it with agile process we use and allow customer to join our team and work out the solution with best cost-effectiveness. This article would give a brief look onto above phases and how they work. Think It. From the very first contacts with our clients, we thrive to understand what their business is and what problem they are trying to solve with our tool. This comes in a form of company background, desired user stories, problem descriptions and business goals. Once we have defined a set of initial scope that has to be covered, our team comes up with initial demos and prototypes. Build It. Once signed up, the team now works more closely with the client team to compile a set of custom user stories, test cases for them and respective performance requirements. Each set of this scope is estimated by the team, so that client is always aware on scope and related cost of the project. The team than plans the sprints accordingly and delivers demos regularly to assure the project is on the track and aligned to customer expectations. Ship It. Closely to project finish, when around 90% of the scope complete, we encourage client to commence internal acceptance testing and alpha test for the users. At this time both our team and client decides when exactly the product should be released and published to the wide audience. Tweak It. The project itself isn’t finished with the final release. During the support period, the team stays focused for any performance issues, scope gaps and common fixes to be brushed up for the post-release period. At the same time, both client and team continues to work on further updates, dictated by business needs, thus contributing to overall online product designer value for end user. The above approach, put into Agile/Scrum methodology we use, provides firm results and is always controllable. For a large company to implement the online design and jump into the market, what could be better?